Greetings from Siem Reap, Cambodia. I'm writing from the Hotel de la Paix just outside the Angkor Wat world heritage site. I arrived here last night on a prop plane from Bangkok, an easy 45 minute flight. Because the internet service was so spotty in Thailand, This is my last Thailand post to do before getting caught up and talking about the amazing things I'm seeing in Cambodia. In the last post I talked about the many reasons to go to Patong in Phuket. Conversely, many Phuket tourists also make the journey up to Phang Nga to see the unique natural beauty of the craggy rock formations jutting up from the see, and the relatively undisturbed wildlife. Phang Nga is home to many of Thailand's natural parks, monuments and wildlife preserves. To enjoy all of this, and with it all seemingly only steps from my hotel, I booked a local "safari" tour called "James Bond Discovery". Most people make the 45 minute journey by bus up to Phang Nga to take one of these tours; my ride was about 5 minutes. Of all the unique and incredible small islands off the coast of Phang Nga, the most famous, or infamous depending on your perspective, is James Bond Island. 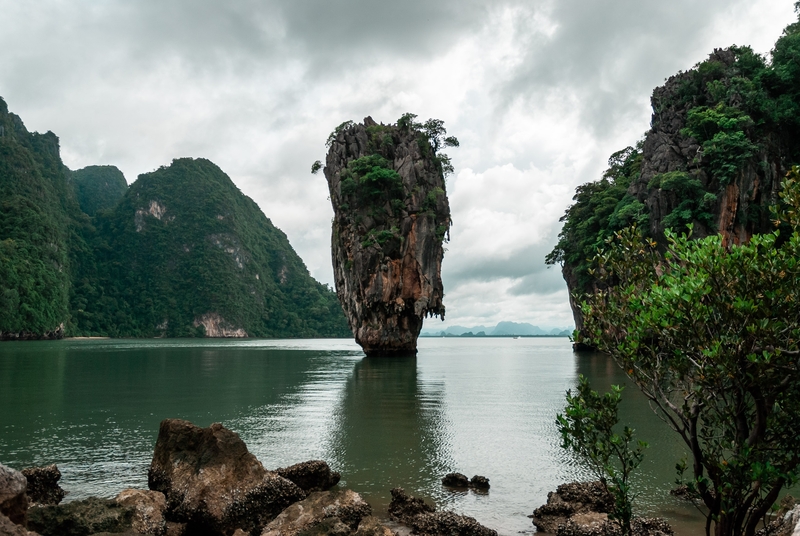 Ko Tapu is located just inside Phang Nga Bay, and had the relative obscure fortune of being featured as the secret island lair of the nefarious evil genius in the James Bond film, "The Man with the Golden Gun". 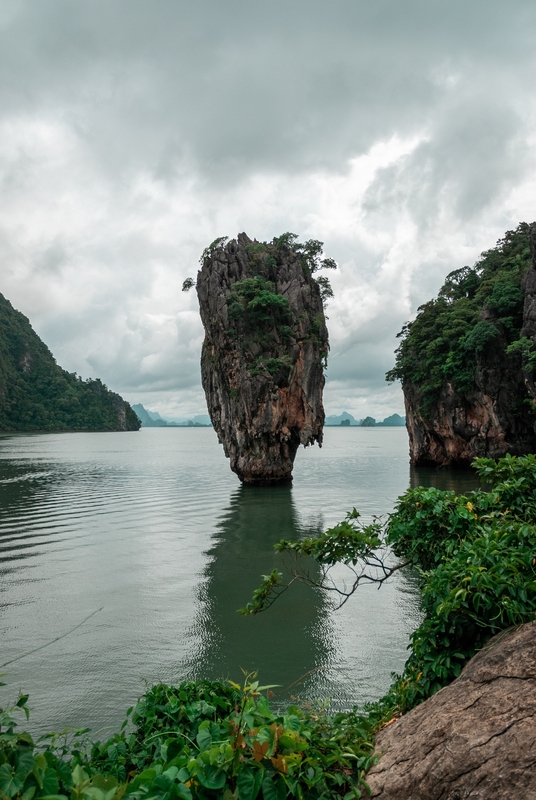 I'll need to revisit the film because I'm pretty sure the location was only visible for about 35 seconds of total film time, but nonetheless enterprising Thai tour operators have since capitalized on this not-quite-15 minutes of fame and forever dubbed it James Bond Island. The island itself is impressive without the gimmick; its centerpiece is an improbable towering limestone rock sticking straight up out of the water to loom ominously over visitors and its surroundings. I will admit that I probably would not have booked a tour called, "Big Impressive Limestone Rock Discovery" so count me as part of the problem. The picture above is the famous vista from the film. Look familiar? Netflix the film and see for yourself. I was there about 30 minutes in total, just enough to snap some photos and leave. The balance of the tour featured some interesting sites: seaside caves within island rocks explorable only by canoe, brackish mangroves with strange walking fish and a floating village of Muslim separatists, all to eager to sell you lunch and take your Baht for posing with monkeys (the food was quite good, but the beer and pork were notably absent). 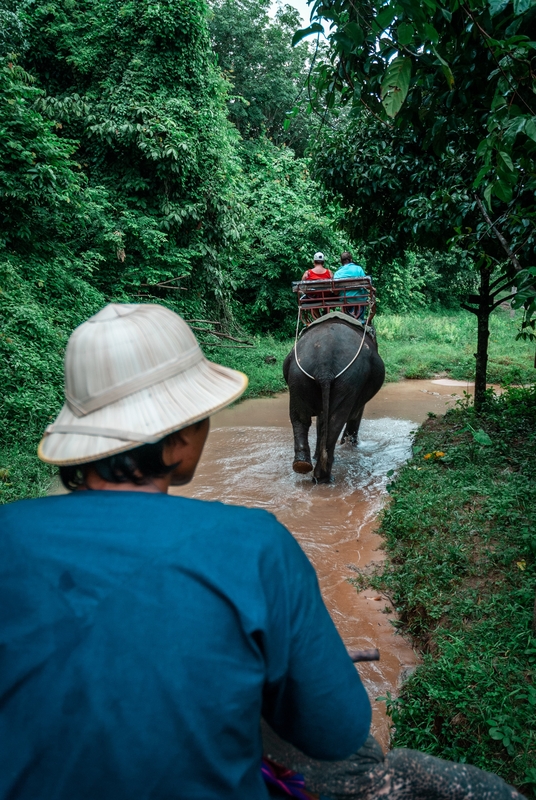 Our last stop was at a Thai elephant preserve to do one of those things that is only done for bragging rights: ride an elephant. Riding an elephant can hardly be described as comfortable, relaxing or, frankly, enjoyable. The smell is atrocious, the ride uncomfortable and the sights ? watching the elephant in front of you let loose with a thunderous defecation ? hardly picturesque. However, I'm pretty certain that I'm the first in my family to ride an elephant, certainly a Thai elephant (readers will be quick to correct I'm certain). I would also hazard to guess that many of the readers of this blog also have not ridden an elephant. So there. The picture below is from the cockpit of my elephant. After the ride, the elephants did some tricks, and I watched a somewhat creepy monkey ride a bike, dunk a basketball and pick up money off the ground. Finally, the elephants perform what they trainers happily describe as "Elephant Thai Massage". Essentially you lie on the ground, in humiliation, while the elephant taps his foot on your back. The whole episode is rather terrifying, knowing the elephant would just as soon kill you as eat a bug. It makes for good photos, though. The Japanese love it. That was the pinnacle of my touristy exploits in Thailand. I went back to the hotel and had cocktails with the new Australian bartender in training. It was pouring outside, we played dice inside, the bartender was new and needed to practice making cocktails, and I was very much in need of enjoying them.